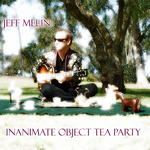 Sign up for Broadjam today to follow Jeff Melin, and be notified when they upload new stuff or update their news! I have always loved music. I began playing piano when I was 11, it did not fufill me in the way that I knew was possible with music. My life changed when I strummed my first chord on an electric guitar. I was hooked. I began taking lessons on the bass in order to fill a need in a band that friends were forming, but I soon switched to guitar. I was 14 then, and there was no turning back. Fast forward 30 some years...I have played in rock cover bands, original metal bands, performed at famous Hollywood venues such as The Whisky and Troubadour, written and self-produced numerous songs and recordings including my CD "Inanimate Object Tea Party" that I released in 2006. I reside in north San Diego county and am employed by a software company doing quality assurance on our products. But I am first and foremost a musician. I play electric and acoustic guitar, bass, mandolin, harmonica, some piano, as well as writing music and lyrics, and I also sing and play a variety of percussion instruments, which includes anything I might find around the house that sounds good when you bang on it. I typically write in a variety of rock styles, but do not classify or restrict myself to any one specific genre, leaving my creative nature to go anywhere it happens to find itself heading. I currently devote much of my free time to song writing and recording in my home studio, as well as singing in a classic rock cover band just for fun. My emphasis for the year 2007 is gearing my songwriting and performing strengths towards Taxi listings with a goal of getting placements in film and TV spots.